We can now see, hear, touch and even taste virtual objects. Could we find a way to give virtual objects a smell? Imagine being in a highly realistic VR reconstruction of a late Autumn forest. The wind is blowing and you hear its sound moving the leaves all around you. You use your new haptic glove to reach out, grab a dry leaf and crumble it in your palm - you feel its texture. Now go a step further and imagine being able to sense the rich smell of damp earth combined with old fallen leaves. This kind of multi sensory experience is not yet possible, but current reaseach and advances point to a future of a VR sensorium. Why smell is so important . Our sense of smell is central to how we encounter and remember the world at an emotional level, and virtual reality, especially for good storytelling, needs to make use of it. Smell, more than any other sense, is directly linked with our brain’s emotional centre, the amygdala, which is responsible for processing emotion, mood and memory. This is why many of us have had nostalgic feelings awoken by a particular smell, be it of food, coffee or of a perfume. This sense can be so powerful that it instantly transport us as far back as our childhood. The direct connection between the sense of smell and the parts of the brain responsible for memories and emotion make it a powerful way of enriching immersion and presence in virtual reality. Besides emotion and memory, smell is also strongly interconnected with taste. In fact, while we eat, we actually taste food with both our mouth and our nose (that’s why when we have a flu everything seems tasteless). An interesting experiment called ‘The meta cookie experiment’ (video below) shows that with the right combination of vision and smell you can easily manipulate someone’s sense of taste. 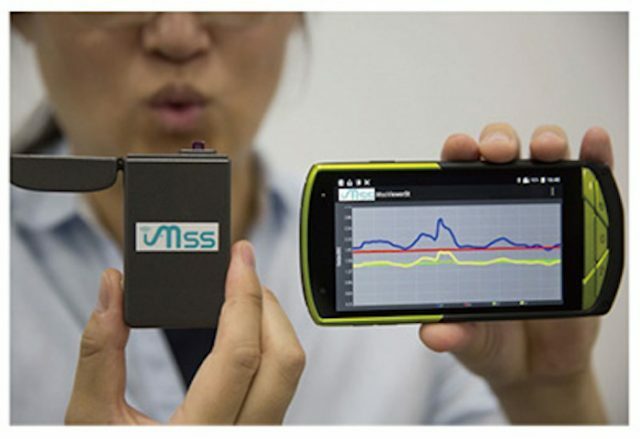 Digital olfaction could be used for medical assessment. Besides the numerous entertainment applications, digitizing the sense of smell could potentially have a big impact in medical applications. Experiments have shown that dogs can smell diseases like diabetes. Mrs Milne, a 67 year old women, can smell Parkinson's disease and has helped scientists develop first diagnostic test. Smell has also been explored in combination with VR for treating PTSD. If more people would have access to digital olfaction devices to train with, perhaps diagnosis on some diseases could be made easier. The big question is: Do people actually want a VR headset that can emit smells? Most people would be at least taken back by the idea. And for good reasons. There are already bizzare devices out there like ‘OhRoma’, a sensory mask that can let you smell “private parts” and “body odor“, and ‘Noculus Rift’ a mask that can let you smell the farts of characters in South Park. Nevertheless, whatever weird paths VR smells might take us, it is certainly an area that should be explored (or sniffed?) more, knowing how powerful of a sense it can be. If you want to get your nose ready for the upcoming virtual smell revolution, I found this TED talk How to master your sense of smell to be an insightful starting point.